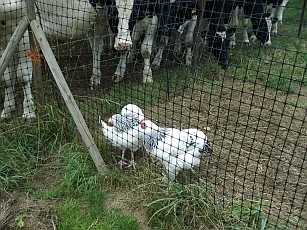 Would you believe that those dear little chicks have grown into enormous cockerels? 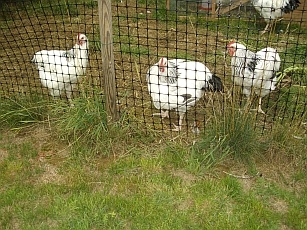 They are bigger than the hens but, all the same, they get pecked mercilessly and chased off by the ladies when it’s feeding time. Gertie, Daisy, Peggy and Susie certainly let it be known who’s in charge. However, Susie has come over broody for the second time. I’ve tried the ‘bottom in cold water’ treatment and isolating her in ‘prison’ in the run (middle above) but she was so unhappy I had to let her out. None of the eggs she’s tried to sit on have been her own and I doubt any could be fertilised because, despite their size, the cockerels are not fully mature. 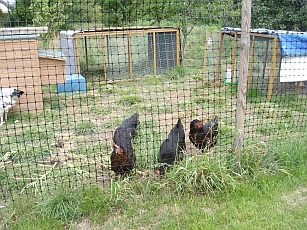 Anyway, I don’t think the hens would let them get near enough to have their wicked way! It’s comical to see these big birds run away squawking when a little black hen goes towards them and the ground is littered with tail feathers from the times they haven’t run quickly enough. 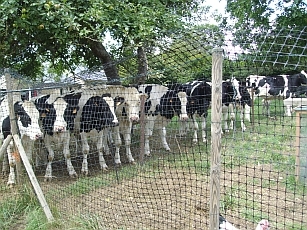 There is mutual curiosity between the chickens and the young bulls next door. . . . .
….. and I just missed them staring at each other but managed to get a shot of the line of bulls after the chickens had got bored and moved away. Last night was the first time I heard two of the cockerels really trying out their voices – and what a racket! They were obviously showing off, strutting about on the roof of the chicken house but they haven’t mastered proper crowing as yet. It was more of a raucous clucking and a rumbling from their throats. Heaven help us – and the neighbours – when they all start as I reckon there are seven cockerels and only one hen among the Sussex chickens. Sorry, but some of them will have to be dinner! As I’m finding it difficult to put fingers to keyboard and write anything even remotely interesting I’ve unashamedly pinched this meme from Helen’s blog. I should point out that LOM found it on Judy’s site so many thianks to them both. 1. When you looked at yourself in the mirror today, what was the first thing that you thought? —My roots are showing and I need a haircut. 2. Do you miss anyone right now? — Not really. 3. If you could move anywhere else, would you? — I love my present house but if ever we were to win the lottery I’d love to live in a chateau and invite all my friends and family to stay. 4. If you could choose, what would your last meal be? — Don’t mind – I’ll eat virtually anything. 9. What’s your dream vacation?—Don’t really want to go away. 12. Have you ever been in love? –Yes – several times. 15. How is your best friend? —Much fitter, slimmer and healthier than I am! 16. Who is the biggest gossiper you know? —Exchanging gossip in French makes tings difficult. 18. What are 3 things you’ve always wanted to do, that you still plan to accomplish? —-Learn to garden successfully, get back to playing the piano, lose weight. 19. What is one thing you’ve learned from your parents? —You make your bed: you must lie on it. 20. What is one thing you hope to teach your own children? —How to be practical and self sufficient.